What’s “Normal” for a Young Child? The amount of sleep an individual needs ranges a lot, based on their temperament, physiology, and daily activity level. The quality of their sleep also varies. Some children fall asleep easily, and some struggle to let go of the day. Some sleep solidly through all disturbances, others wake frequently. Some wake up happy and bright in the morning, others are sluggish. These sleep temperaments can appear at birth, and remain with the child throughout life. However, don’t be too quick to “label” your child as a ‘good sleeper’ or a ‘bad sleeper’, because there are definitely things that parents can do to improve any child’s sleep, and also habits we can develop that impair our child’s ability to rest well. Children who sleep in the same room, or same bed, as their parents tend to have more night-time wake-ups, but may also have more total sleep than those who sleep solo. Have a fairly stable, reliable daily schedule to help set their biological clock. Include plenty of physical activity during the day. This will help them rest better at night. Teach day and night: in the daytime, keep the house light, don’t worry about noises, and be interactive. In the night-time, keep lights dim, be quiet, and interact as little as possible. Try to create a consistent sleep environment. Having familiar toys, standard bedtime music, and a typical light level help reinforce that this is the “time and place for sleep.” Do change things a little from time to time, as you don’t want to get into a situation where your child is ONLY able to sleep if they have one specific object with them, since that object might get lost! Know your child’s tired cues. As they near the end of their day, do they get bleary-eyed and yawn and rest a lot? Or do they get wild and wired and run around crashing into things? Try to start your wind-down time before you see these cues! It’s usually easier to settle a just-tired-enough-to-sleep child than an overstimulated-overloaded child. About ten minutes before bedtime, start the official bedtime routine. Keep it short and simple! No more than fifteen minutes. Set clear limits on time and number of activities. Tell them the routine and stick to it: “remember, every night we read exactly two books.” If kids learn that some nights they can talk you into more, they’ll negotiate for more every night! Changing into pajamas can be a signal that bedtime has come. Some parents teach relaxation and visualization techniques to help the child self-soothe. The standard is bedtime stories… choose calming sweet stories, and save the rollicking stories for other times of day. Some children like variety, some want the same stories every night. How do I know if my child has a sleep problem? Don’t listen to outsiders on this one: it doesn’t matter what your friend, neighbor, or mother-in-law thinks. It matters how you feel! If it’s working for you, your partner, and your child, then NO, you don’t have a sleep problem. If, however, you, your partner, or your child are miserable, stressed out, sleep-deprived, frequently ill, or just tired of the situation, then take steps to fix the problem! 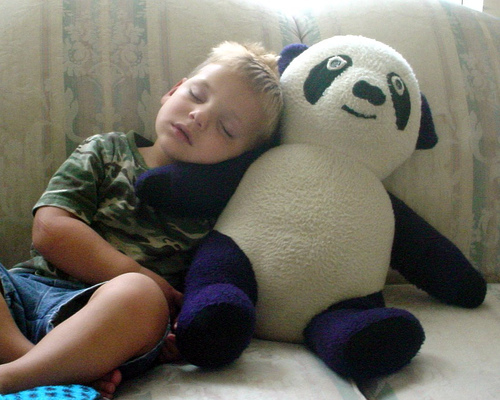 When your toddler was a baby, you found things that worked to help him sleep. And you’re probably still doing them! What seemed manageable then may be getting old now. If you’re ready to make a change, such as moving your child to his own bed, changing the bedtime routine, or changing how you respond to night wakings, here are some helpful strategies. Sleep diary: Spend a week tracking: what time does your child go down to sleep, what steps did you take to get her there, how long she slept, mood on waking, and so on. Once you have a better sense of what’s actually happening right now, it’s easier to begin figuring out what to change. Goal Setting: Figure out what things would look like if sleep was going better. How are things for you and your child? Having that end goal in sight can help you prioritize the steps to get there. Make a plan. Prep your child for the change, letting them know what to expect. Writing down the new plan, or creating a picture calendar of the plan may help them. Make changes gradually. Set your own limits for how long you’ll try something… maybe you’ll try for ten days straight, and if that doesn’t work, you’ll give up for a month, then try again. Children usually begin to learn a new behavior after 7 repetitions. But sometimes you just need to wait till they grow up a little bit more. This entry was posted in Child Development, Parenting Skills and tagged bedtime, nap, sleep, toddler on April 16, 2014 by Janelle Durham.